The all-dialogue portions of Wallace's work are probably influenced most by Gaddis's J.R. and Manuel Puig's Kiss of the Spider Woman, the latter of which he admits to outright stealing from in his use of an ellipsis ('...') for a character's non-response. 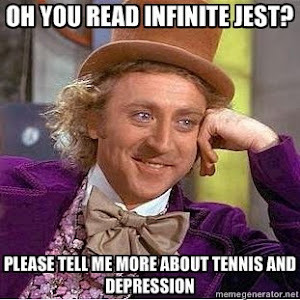 But I think books like IJ and eg Eggers' AHWOSG are a bit too obvious, a bit too try-hard, in their cleverness and literary showing-off. But with Waugh, the brilliance of the whole book means that you don't even notice all the cleverality. Having said all that, I'm enjoying it so far. I'm at 6% on the old Kindle if that makes any sense.